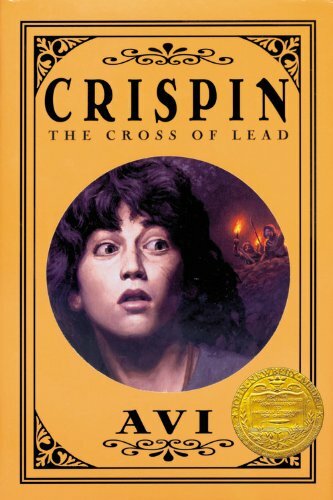 Crispin: the cross of lead by Avi is a Newbery Award winning story about young people confronting the harshness of life during 14th century Europe. The novel illustrates the impact of life threatening conditions upon the lives, behavior, and mindset of young people and adults. Crispin: the cross of lead is set in England during the years 1344. Asta’s son, the narrator, is orphaned when his mother dies. John Aycliffe, the cruel manor steward, demands that he cede their ox to pay the death tax the next day, but that night Asta’s son spies Aycliffe meeting with a mysterious man in the forest. The next morning Asta’s son is declared a “wolf’s head” with a bounty on his head to any one bringing his body to the manor. Father Quinel, the only living person that Asta’s Son trusts, begs him to flee, but when he returns to the priest for food, directions, and an important secret, he discovers that the priest had been murdered. On the run with no food, no money, and only a bag around his containing his mother’s cross, he finds only abandoned village left over from the plague. Finally he meets Orson Hrothgar, better known as “the Bear”, a juggler who traps him as his servant in exchange for food. Bear teaches the boy to sing and play the record, and is a strict, but kind master. On their wanderings it becomes apparent that Aycliffe has not given up his search for the boy. The novel reaches its climax as all characters converge for the annual St. John’s festival and market day. This book offers young people a beautifully narrative about a world very different from our own. In a world divided into noble and serf, one either owns or is owned. The narrator does not even have a name beyond, "Asta’s Son" until he is thirteen and then only by the incidence of his mother’s death. As Asta's Son eludes his pursuers, makes new friend, and assumes a fake identity, he slowly learns that true identity lies within and is not dependant upon a name. Crispin: the cross of lead by Avi is beautifully written novel. It will delight both adult and young readers. The book is recommended for ages 8 years through 12 years and contains no violence, sexuality, or language that will upset even the most discriminating parents. I highly recommend this book.